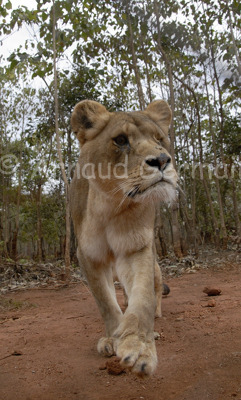 arnaud germain wildlife photography: Bella the Lioness. Bella came to Malawi in 2008, from Romania, where the Born Free Foundation found her in a poor state. Bella lost an eye and her back legs are slightly difformed due to poor care. She is a lovely lioness and likes human contact (through a fence!) I took this picture at the Lilongwe Wildlife Centre, where she now has a huge enclosure. I used my 18mm lens, which I put really low against the fence and then called Bella. She came to see me and I took the shot when I thought she was filling the frame.